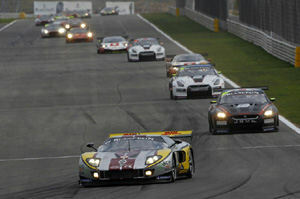 No.22 JRM Nissan GT-R scores to second places in a race dominated by Marc VDS Ford GT. 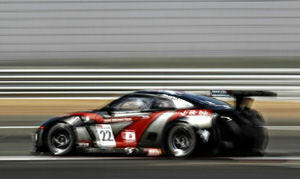 Round 8 of the 2011 FIA GT1 World Championship was held at the Ordos International Circuit in Inner Mongolia, China on the weekend of September 3rd and 4th, 2011. 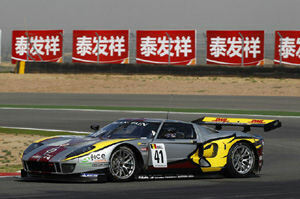 Both races were won by the No.41 Marc VDS Racing Ford GT driven by Maxime Martin and Frederic Makowiecki. 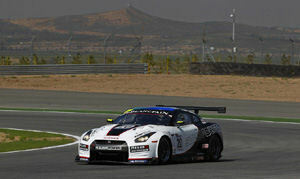 The No.22 JR Motorsports Nissan GT-R of Richard Westbrook and Peter Dumbreck finished second in both races. The Sumo Power GT-R's followed in third (No.21) and fifth (No.20) in the Qualifying race, while the second JRM Nissan GT-R (No.23) finished in 11th. In the Championship race, the remaining Nissan GT-R's had a tough time, with the No.23 JRM Nissan GT-R finishing in 9th position. The No.21 Sumo Power GT-R finished in 7th position, while its sister car (No.20) was involved in an accident and dropped out of the second race after lap two. Fred Makowiecki and Maxime Martin underlined the Ford GT's liking for the tight confines of the Ordos International Circuit to record a lights-to-flag victory in the Qualifying Race. Starting from pole, the No.41 Marc VDS Racing driver couple led home the No.22 JR Motorsports Nissan GT-R of Peter Dumbreck and Richard Westbrook with the No.21 Sumo Power GT of David Brabham and Jamie Campbell-Walter third. It was the third Qualifying race win for Makowiecki and Martin after victories in Abu Dhabi and Sachsenring. Elsewhere in the field, the No.20 Sumo Power GT of Enrique Bernoldi and Nick Catsburg finished the race in fifth place, and the No.23 JRM of current Drivers' Championship leaders Michael Krumm and Lucas Luhr, carrying 60 kg of success ballast from the car's double victory at Paul Ricard in round 7 of the series, finished 11th. Pre-race predictions that the Nissan GT-R's would not be suited to the short and twisty Ordos circuit were proved to be totally unfounded in the morning's Qualifying session, as all four Nissans powered through to the final-eight shoot out of Q3. The No.22 JRM was pipped to pole position by the No.41 Marc VDS Ford GT in the dying seconds of the session, whilst the No.20 Sumo Power GT finished fourth, its No.21 sister car fifth, and the No.23 JRM seventh. The No.41 Marc VDS Racing Ford GT and No.22 JRM Nissan GT-R got a clean start to the afternoon's Qualifying race and could pull away from the rest of the field. The No.20 Sumo Power GT, with Bernoldi starting behind the wheel, was to be the first Nissan mover of the day, overtaking the No.38 Lamborghini for third in the opening seconds. Brabham followed suit to move up into fourth several laps later. 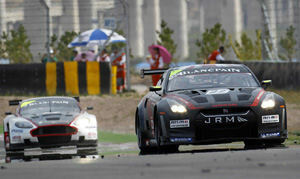 Further back, the No.23 JRM had endured a less satisfactory start, with Krumm losing two places to slip back to ninth. On lap 15, Brabham in the No.21 Sumo Power GT, who had steadily chased Bernoldi in No.20 down since moving up into fourth, managed to overtake his Sumo Power GT team-mate for third place during the last seconds of his stint in the car. This meant the GT-R's sat second (No.22), third (No.21), fourth (No.20) and ninth (No.23) as the 10 minute pit window for driver and tire changes opened. The stops saw the No.22 JRM maintain second, but close the gap to the No.41 Marc VDS to just 1.6 seconds - down from over three seconds before the window opened. The two Sumo Power GT's retained their respective third and fourth positions, albeit over 20 seconds down on second place, but the No.23 JRM was to again suffer misfortune, dropping five places to come back out in 14th due to an issue with a wheel nut. The second half of the race saw a tight battle for the lead between the No.22 JRM Nissan GT-R and No.41 Marc VDS Racing Ford GT, although the No.22, with Westbrook now in the hot seat, was never quite close enough to try and overtake the No.41. The No.23 JRM was able to make up three places for 11th, whilst the No.21 Sumo Power GT of Campbell-Walter was able to pull away from its sister car. The No.20 found itself running out of steam somewhat, eventually conceding fourth place to the No.3 Hexis Aston Martin DB9, which had started from 10th position on the grid, on the final lap of the race, despite the best efforts of Catsburg behind the wheel. It was a disappointing day for the Team China Corvettes. Home town hero Ho-Pin Tung did not have a turn at the wheel after the No.11, with co-driver Jeroen Den Boer doing the first stint, retired on the second lap with severe front bodywork damage after a clash with the No.10 Belgian Racing Ford GT. The Chevy Corvette had started from a lowly 16th position after a disappointing Qualifying session. 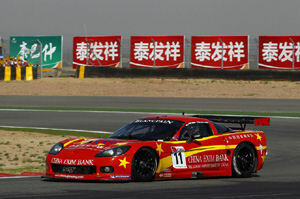 The sister Team China Corvette of Michael Rossi and Sergio Jimenez had a stirring start with Rossi making up four places on the first lap from 12th place on the grid. During his stint Jimenez was running strongly in the top 10 but was forced to retire three minutes from the end with a mechanical problem. In the battle at the head of the drivers' championship standings, the All-Inkl.com Munnich Motorsport Lamborghini pair of Marc Basseng and Markus Winkelhock finished the race in 6th place but in post race scrutineering the Lamborghini Murcielago was found to have exceeded the homologated width measurement and was excluded from the result. As a result, championship leaders Michael Krumm and Lucas Luhr, who had crossed the finish line in 12th, were promoted to 11th. Speaking afterwards, Peter Dumbreck, No.22 JRM Racing, said: "Even starting from P2 it was very important to get through the first corner and round the first lap without a problem, so I was relieved to do that and then get on with the racing. I was able to pull a gap on the rest of the field and then it was a case of trying to stay with the Ford GT ahead of me. Our GT-R ran really well today - it's been a satisfying day at the office." Dumbreck's team-mate, Richard Westbrook, added: "Peter handed over a good car - it was running perfectly. At first I thought I could catch the Ford, but he was able to maintain the gap between us." "It was a really tough pace and both of us were on the limit, so I was making sure I could stay in contention in case he made a mistake. It's great to be back on the podium again and to have another front row start tomorrow. A lot of credit must go to the JRM boys behind the scenes who did a brilliant job." Jamie Campbell-Walter said of the No.21 Sumo Power GT's third place: "We had a great car, a great pit stop and it was a great race. My thanks go to the lads in the team for another quick tyre change. It's good to score a top three finish again and we are therefore in a great position for tomorrow's race, when it would be great to be battling for an even higher place. If we can find just a little more speed, then I think that's more than possible."